Quick English writing tips for learners on the go! Bettina, an English learner like you, discovered this website and my English writing tips and loves them. She works hard to improve her English. 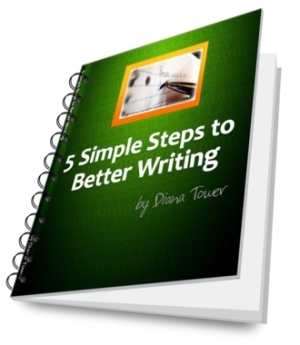 She is also the proud owner of my new eCourse, “5 Simple Steps to Better Writing”. “I love listening to your voice Diana. What a pleasure! You're advice is great and I know it'll be extremely helpful. It's clear and not boring at all. With my help Bettina discovered that writing in English can be fun, useful and interesting and I would like to help you discover a love of writing too. In this course, I suggest some easy English writing tips to make your writing clear, interesting and correct. Why is my Writing eCourse so Special? Well, we do not focus on grammar. I do include a section of it in the course, but grammar is not everything. I also made the exercises interesting. Who wants to write about a blue book or a glass of water? That is why I made each interactive “your turn” exercise a real situation. Where did you go on vacation? How was your doctor’s appointment? It is easy to see that Bettina loved the audio. Listening is the key to improving almost every aspect of English so why not use it to improve your writing. 5 Simple Steps in under 30 pages. Who needs another course with hundreds of pages? You don’t have time to read all of that information, so I made sure that this course was easy, effective and focused. I show you how to enjoy writing, rather than destroy it. What I mean is that when you focus on the grammar too much and different parts of writing you loose sight of why you are writing in the first place. We write to express ourselves and communicate. Is This eCourse For You? 1) Can you write, but feel limited when you write in English? 2) Do you lack confidence and feel your writing will never improve? 3) Are you searching for a better and fun way to improve your writing? 4) Are you looking for some interesting English writing tips? If you answered yes to any of those questions then my “5 Simple Steps to Better Writing” eCourse was made for you. Let me share my English writing tips with you. Thank you for your efforts; they are highly appreciated. I would like to thank you from the bottom of my heart for this valuable course. I believe that it is a very important resource for writing learners and it quickly sums up a long learning course in less than 30 pages. I recommend it for all levels of learners. I'll keep visiting your nice website and English corner (ESL Cafe). I like when you talk about your father in your book. Every time I see the word "knife" I smile. Business also makes me laugh. I'm sure in the future I'll spell it right as well. If you don't understand what I'm talking about have a look at Diana's book. You won't regret it. Trust me. The free mp3 version of your book is so beautiful. I was so happy when I listened to your voice and the short stories of how to cook a chicken. I couldn't stop listening. Best wishes and thanks for everything. Diana...I don't have enough time to study! I thought you might say that, so I created an audio version (MP3) of the eWorkbook (worth €9). Today, I'm including it as a free gift when you buy my “5 Simple Steps to Better Writing” PDF eWorkbook. Like Bettina, you will be able to take my English writing tips everywhere you go (on the metro, in your car, at the gym...and anywhere else an mp3 player or cd can go). How can I improve my writing if I don't have any examples to look at? Great question! To help you, I have also included free examples for each exercise so that you have something to compare your work with. Ok Diana...but I want to focus specifically on proofreading too. It really is your lucky day! If you buy my “5 Simple Steps to Better Writing” eWorkbook today I will also include my “Proofreading tutorial” (worth €14)...for free! In my easy to understand tutorial, I will show you common mistakes that learners make and help you eliminate them through engaging activities and understandable explanations. Alright...but...I'm still not sure if this eWorkbook is right for me. I've explained this writing eCourse as clearly as possible, so if you still have doubts, the best way to find out is to try it. You can't go wrong. Why? If during the first 60 days, you decide it didn't help you or that it wasn't what you wanted, just ask for your money back and I will return your money...no questions asked. That is almost €50 worth of English writing tips material. Get your copy today while this special offer lasts. Happy Learning. Once you get these English writing tips return to the homepage for more helpful articles and resources.